Join us for a Graduate and Professional Open House at Texas A&M International University Tuesday, Feb. 12 from 10 a.m. - 2 p.m. at the Student Center Ballroom. Prospective graduate students can visit with more than 15 graduate schools from across Texas. Some of the schools and programs expected to be in attendance include Our Lady of the Lake University, Schreiner University, St. Mary’s University, Texas A&M Health Science Center, Texas A&M University-Corpus Christi, Texas Tech University Health Sciences Center, Universidad Autonoma de Guadalajara School of Medicine, University of the Incarnate Word School of Osteopathic Medicine, University of Texas at Arlington, University of Texas Rio Grande Valley and many more. 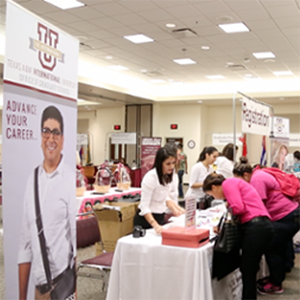 TAMIU’s Graduate School will also be on hand to provide information on degrees available in business, education, health and more. Currently, the University offers courses both in-person and online. During the Open House, representatives from the participating universities will be present to answer any questions regarding the application and admission process. The Open House is hosted through the University’s Office of Career Services, which offers a range of services that includes creating resumes and cover letters, practicing interviewing skills and access to Dusty Works. Services are available to students, parents, alumni, job recruiters, and university faculty and staff members. For more information, contact the Office of Career Services at 956.326.4473, email careerservices@tamiu.edu, or visit offices in the Student Center, room 114.